How does the compounding system and other accessories for the concrete mixer work? In the previous article How does the double horizontal shaft forced mixer works?, Zhenheng to everyone popular JS double horizontal shaft forced mixer is how to work, then, Zhenheng imagine you about JS double horizontal shaft forced mixer ingredients system and accessories, in the whole process of production is how to work. 1 Feeding system is composed of hoisting mechanism, feeding track, hopper, pulley group and so on. 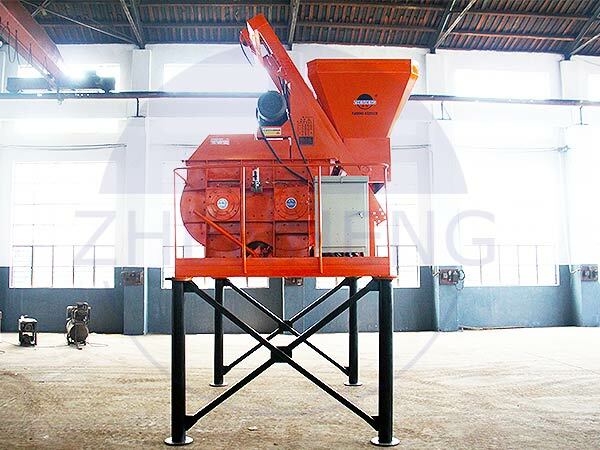 The hoisting wheel is driven by the reducer to rotate the drum, Material into the mixing bucket, in order to ensure that the hopper in place in the loading track with a limit switch. The upper limit is equipped with two limit switches, respectively, on the hopper up the limit and safety protection, when the hopper to the discharge position, the hopper hit the first limit switch, so that the circuit, motor Brake complete discharge. If the first limit switch fails. The hopper continues to rise, the striker strikes the second limit switch, so that the feeding circuit is broken. At this time feeding button failure, the hopper can only fall, can not rise, only to be hopper fell into the pit, the first change the first trip switch, and then connected to the material circuit, feeding button to resume work. The lower limit has only one limit switch, which is mounted on the top of the track. When the hopper drops to the bottom of the pit, the wire rope is slightly loose and the spring lever mechanism moves the lower limit and the hoisting mechanism stops automatically. Brake motor can ensure that the hopper at full load operation, reliably stop at any position, the size of the braking torque, the rear seat of the motor by the big nut adjustment. Discharge mechanism by the discharge gate, the valve, cylinder, electrical and other components. Discharge door for the arc, by an air compressor and two cylinders through the lever mechanism and electric control valve to complete the discharge gate opening and closing action. When the accident situation, such as emergency power failure or cylinder failure, the user can manually discharge lever for manual discharge, this time the cylinder and the lever mechanism to be disengaged to prevent the cylinder out of control, bullet operator, usually should Manual unloading rod removed to prevent wounding. In order to prevent the leakage of concrete, in the material at the door installed with sealed rubber, by adjusting, can guarantee the sealing integrity of the discharge gate. The water supply system consists of water pumps, motors, throttle valves, bottom valves, flushing pipes and pipes. Throttle valve can adjust the flow of water, water supply by the time relay control. When the button is in the "AUTO" position, the pump will run at the set time and stop by itself. When the button is in the "manual" position, the water can be flushed continuously. Electrical system in the control circuit with automatic switching, AC contactor, with short circuit protection, overload protection, phase protection function. All control buttons and air switch handles and indicators are arranged on the distribution box door, and a door lock. There is a protective cover on the outside of the button. Distribution of the electrical components installed in an insulated board, safe and reliable, easy operation and maintenance. Previous:How to Maintain Concrete Mixer?